First of all, what does SLGT-2 stand for? SGLT-2 stands for ‘sodium-glucose linked transporter 2’. SGLT2 is a protein within the kidney tubules that regulates glucose reabsorption in the kidneys. Typically, all of the glucose that passes through the kidneys gets reabsorbed. However, in many with diabetes, the glucose load may be too much for the kidneys to filter, so that rather than being reabsorbed, some of the glucose will be spilled into the urine. Often, this is the first sign that many have, when discovering that they have diabetes. Glucose in the urine is called “glycosuria” and to be clear, this is an abnormal finding. The term “diabetes mellitus” derived from two words. The word diabetes meant to urinate excessively (like a “siphon”). The word mellitus meant sugar, or sweet. In nursing school, we were told the tale that long ago, it was one of the responsibilities of a nurse to taste urine to see if it tasted sweet, in order to diagnose diabetes. Man, am I glad I am a nurse now and not 100 years ago! I’m off track already….ok, back to the topic at hand! How does an SGLT-2 Inhibitor work? Well, an “inhibitor” is something that “inhibits” something else, or works against something else. So, an SGLT-2 “inhibitor” blocks the action of SGLT-2, thereby, allowing some of the glucose ingested, to pass out through the urine. So, you basically urinate out some of the glucose you eat. This class of drugs is sometimes called a “glucoretic.” In other words, we are familiar with how a diuretic works, it causes us to lose fluid in the form of urine. Therefore, a “glucoretic” causes us to lose glucose through the urine. It is estimated that 30-50% of the filtered glucose load can be “inhibited” or up to 50-80g of glucose can be eliminated daily in the urine (2). Although it would seem that a drug in this class could be used for people with Type 1, it is not approved for such use. There have been some trials with this drug class on those with Type 1, but due to the potential for DKA associated with the use of this drug, there has been strong warnings against its use with Type 1. This drug class is targeted toward treatment of people with Type 2’only. This drug has an average A1c lowering capability of 0.7 – 1.5% (1). For some, this drug can cause minimal weight loss (1-3 lbs) (1). 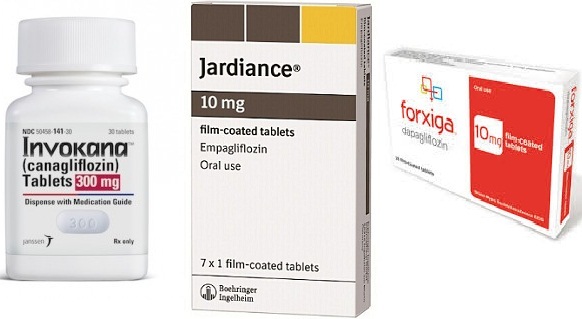 Drugs in this class: Farxiga (dapagliflozin), Invokana (canagliflozin) and Jardiance (empagliflozin). These drugs are also included in combination with metformin. Xigduo (Farxiga + metformin), Invokamet (Invokana + metformin), and Synjardy (Jardiance + metformin). If the blood is concentrated with lots of glucose, the body doesn’t like for the blood to be so concentrated. Our bodies like “homeostasis” right? If we get hot, we sweat to cool down. If we are dehydrated, we get thirsty. If we are cold, we shiver (which warms us up). If the blood sugar is high, the body makes insulin to lower it. If the blood sugar is low, the body releases stored glucose to raise it. So, the body likes to maintain a constant state of homeostasis. So, once again, if our urine is concentrated with glucose, more water will be accompanying it and more water will be eliminated with it. For many, this can lead to dehydration. Hence, dehydration is a common side effect of this medication. If you take this medication, it is often recommended that you significantly increase your water intake. Now, when there is less fluid in the body, there is less pressure (which is why those with high blood pressure are often given diuretics to lower blood pressure – less fluid equals less pressure). Hence, low blood pressure can also occur with this medication due to the loss of fluid. Once again, increased water intake will be necessary. This drug can also cause urinary tract and genital yeast infections. Why? Because glucose is in a place that it does not belong. Glucose does not belong in the bladder or in the genital area. When you combine glucose and a warm, moist environment, there is potential for yeast growth and infection. If you take this medication, it is often recommended that you use sanitary wipes after each episode of urination to keep the area free of glucose. This drug is linked to Diabetic Ketoacidosis even in those with Type 2 diabetes (which is typically very uncommon). This drug is also linked to worsening kidney issues (decreased filtration rate). This drug is not typically prescribed in those without adequate kidney filtration, as it would be ineffective when the kidneys are not working properly. If you take this drug, your kidney function should be regularly monitored. Some drugs in this class may not be used in those with bladder cancer. Recently released studies show that with one drug in this class, the prevalence of diabetic amputations (involving toes, feet and legs) DOUBLED! Yes, taking this drug could double the risk of losing an appendage or limb. Above all, REMEMBER, diabetes is a problem of GLUCOSE INTOLERANCE. The answer to that problem is not “take in all the glucose you want and then take a drug to make it go away.” That is like telling someone with lactose intolerance to “eat all the milk and cheese you want and we’ll give you a pill to try and make it better.” No! People with lactose intolerance are told not to eat milk and cheese. It is the same with diabetes. People with diabetes should consume as little of the foods that turn quickly into glucose as possible. Then, there will be no need for pills to take the excess glucose away. I believe that drug therapy has it’s place, but ONLY to address any issues after a healthy, low carb lifestyle, exercise and other lifestyle practices are ALREADY in place. So, if you are already practicing these things, I find it hard to see where this drug class might be of any benefit. Keep in mind, the A1c lowering capability of this drug is extremely poor when compared to low carb. I have personally known people with Type 2 who have experienced DKA with this drug. DKA can be a life threatening condition. I have serious reservations about this class of medications, particularly for those following a low carb lifestyle.